Make a small 2x5(ish) mold with foil (see photo). Pour the peanut butter mixture into the little mold and chill it for about a half hour or until firm. Unmold the peanut butter log and cut into chunks. Proceed with the cookie dough. Cream butter and both sugars with an electric mixer. Beat in peanut butter, then baking powder, baking soda, and salt. Add eggs one at a time, beating on a lower speed, then beat in vanilla. By hand or using lowest speed of mixer, Stir in the flour. 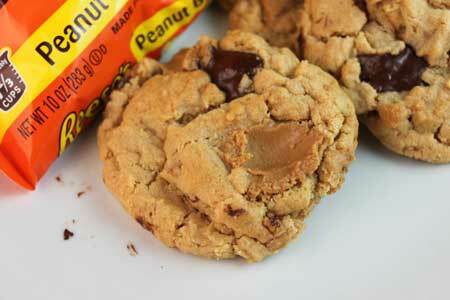 When flour is mixed in, stir in chocolate chunks and peanut butter chips. Preheat oven to 350 degrees F. Using slightly less than a quarter cup measure, scoop up balls of dough and arrange on cookie sheet a few inches apart. Stick peanut butter chunks into the already-scooped dough.